Maetel abandoned her mother and her home planet, the doomed and frozen La Metal, where people must become cyborgs to survive. When she is beckoned to return, her options seem slim: follow her mother's path (and with it a robot mind and the contempt of all humans), or run away and fight with humans against the machines. Yet, she is not without comrades and defenders. If she can accept the friendship of beings of metal who desire peace, and oppose those who think being made of flesh and blood is enough to make one human, she may still have a chance to find her own path. I think the anime world must think that Leiji Matsumoto fans will put up with just about anything. As if the Maetel Legend OVA wasn't bad enough, they double-down on it by expanding that story with this crap series. Sure we get to see some nice retro character designs and a great CGI Death Shadow, but the writing on this series was just about as bad as I've ever seen in all my 30 years of watching anime. The scripting of each episode was so abysmal that it was making me physically angry. Of the 5 1/2 hours the series runs, I would say there is 30 minutes of combined awesomeness and 5 full hours of forgettable garbage. Things have gotten so bad that the climactic battle includes Promethium using a giant Death Star . . . I mean it IS the Death Star. Pathetic. Ok, we do have crappy Maetel Legend and other stuff that delayed my watching of these series by 10 years since its release in 2005. The first two episodes looked like another pathetic effort. But. I have to disagree with another reviewer here. Or maybe I got used to garbage... maybe not. 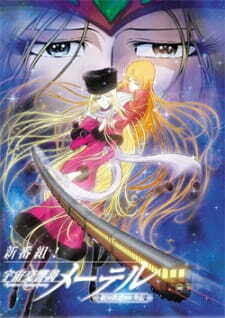 Being a Leijiverse fan, I can say this: Space Symphony Maetel is the #3 piece to watch after GE999 and GE999-2 movies. It is better than GE999-TV and better than Harlock-78. It introduces new things to Leijiverse, it follows the lore. Creators do show us they're familiar with Legend of Galactic Heroes and Terminator 2, there really is a Death Star. But on everything else, it's a smooth, quality Galaxy Express show. And you know what... its message actually makes sense, unlike Queen Emeraldas, Maetel Legend and some other stuff. CG is awful, but cell animation is good, on the level of GE999 films, however there are small things to criticize. The big problem I faced was tastelessly bright and contrast colors, which I fixed by reducing picture contrast by 40%, reducing saturation and increasing brightness a bit. After this, it looked like a valid leijiverse animation worth watching on my projector.